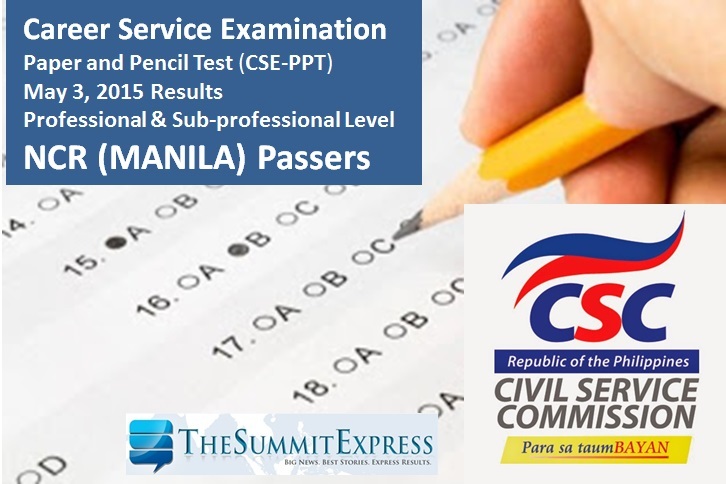 The Civil Service Commission(CSC) officially released results of May 3, 2015 Civil Service Exam- Paper and Pencil Test (CSE-PPT) also known as Career service examination on Friday, June 12, 2015. List of passers for Manila or NCR region is now available online. CSC said that Metro Manila (NCR) has the second highest number of examinees with a total of 25,430 comprising 14.07 percent for Professional and SubProfessional levels. Passing percentage for CSE-PPT exam is 80.